Greetings again from the darkness. Our biggest fear was that Greek director Yorgos Lanthimos would one day soften the twisted edge he blessed us with in THE KILLING OF A SACRED DEER (2017), THE LOBSTER (2015), and DOGTOOTH (2009). That day may yet arrive, but not today and not with his latest. It’s his first time to direct a screenplay he didn’t write, which likely explains this being his most accessible film – though labeling it “mainstream” would be a huge stretch. So brace yourself for an unusual and odd costume period piece unlike anything you’ve seen before. Co-writers Deborah Davis (her first screenplay) and Tony McNamara (TV background) deliver biting dialogue and treacherous situations, and benefit from three staggeringly terrific lead actress performances. 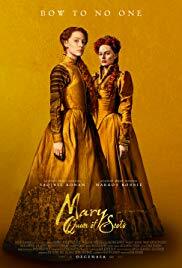 Olivia Colman stars as Queen Anne, Rachel Weisz as Lady Sarah Churchill, and Emma Stone is Abigail. The three combine for one of the strangest and most convoluted love triangles and power struggles in history. It’s very early 18th century and Britain is at war with France. Queen Anne is frail and in ill health due to severe gout and who knows how many other ailments. Her erratic behavior and quick temper convey childlike behavior from an adult body with a crown. Lady Sarah (Winston’s great-great grandmother, if I’ve calculated correctly) has strategically become the Queen’s trusted political advisor and often governs in her stead, while also sharing moments of intimacy. Sarah pulls no punches and certainly doesn’t subscribe to the ‘kill ‘em with kindness’ approach, and instead frequently insults the Queen to her face. When Sarah’s cousin Abigail appears after her family’s fall from grace (her father lost her in a card game), Sarah takes pity on her due to Sarah’s fondness of Abigail’s father during her childhood. Abigail’s naivety and kindness soon win over the Queen’s affections. Is her sweetness an act? Is it due to ambition or desperation … is there even a difference here? We soon learn Abigail treats conniving as a profession – she views it as her only path back to respectability, and she’s willing to take on many acts lacking in respectability to charm her way into the inner sanctum. We are plopped into the wicked fun, delicious cat-fighting, strategic backstabbing and crafty political and personal maneuverings … right up until the story turns to vicious bleak darkness in the final act. It’s fascinating to watch three women hold the power during this era, as the noblemen are relegated to constantly playing catch-up (kind of like the real world) and struggling to figure out the rules of the game. Power struggles abound, as do director Lanthimos stylistic touches. Noblemen played by Nicholas Hoult and Joe Alwyn are frequently dressed in frilly costumes, giant wigs and heavy make-up – quite the contrast to what we typically see in these period pieces. 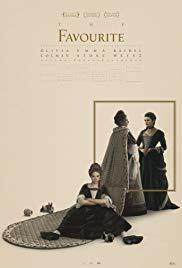 Other Lanthimos touches include royal duck races, pet bunnies representing deceased children, and fisheye lenses used from every conceivable angle. Ms. Colman and Ms. Weisz were both in THE LOBSTER, and both have a knack for the Lanthimos style, and Ms. Stone surprisingly is also a natural with the twisted, vicious material. Each of the actresses have an extended close-up allowing them to show-off their immense and subtle talent … Ms. Colman’s is especially impactful. Extreme profanity (numerous c-words and f-words) is at times startling and effective, and the music is unique and diverse – as we would expect. 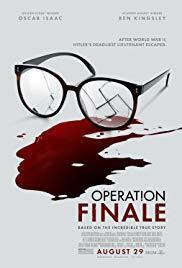 As an added bonus, it requires little imagination to connect the dots to our contemporary political state, although that approach would likely stifle one’s enjoyment of the film. Mr. Lanthimos has quickly reached the ‘must-see’ list of directors, with a guarantee that we are going to see something unusual and interesting. It’s one of the year’s best, even if it’s not for everyone. Greetings again from the darkness. It has taken two movies this year, THE MISEDUCATION OF CAMERON POST and this one from writer-director-producer-actor Joel Edgerton, and I finally understand that the practice of conversion therapy (treatment designed to change a person’s orientation to heterosexual from something else) is real … and it’s widespread … and it’s cruel … and it’s absurd. I’ll readily admit that my little life bubble has previously protected me from knowing much about the world of conversion. Lucas Hedges has quickly developed into a dependable dramatic actor with his moving performances in such films as MANCHESTER BY THE SEA, LADY BIRD, and MID90S. Here he stars as Jared Eamons, a college aged young man struggling with the inner turmoil that accompanies being a gay man raised by a Pastor-dad in the heart of the Bible belt. Since the film is based on the memoir of Garrard Conley, we can assume much of what we see and hear has been seen and heard by Mr. Conley in his life. Jared’s parents are played by Nicole Kidman and Russell Crowe, and while the parental actions of their characters may confound us, both deliver strong performances. One especially impactful scene allows Ms. Kidman to show what sets her apart … it occurs in her scene at a table with Hedges when momma finally takes control. Director Edgerton appears as Victor Sykes, the director and “therapist” at Love In Action, the refuge program where Jared’s parents send him. Over the opening credits we get childhood clips showing Jared was a “normal” little boy being raised in a loving household. Flash forward to his awkward date with a girlfriend who asks him “what’s wrong?”. Later, after being sexually assaulted by a college buddy, Jared comes out to his parents. His time in Sykes’ program is filled with unimaginable steps. A Genogram is to be completed, listing all of the personal problems and “dangerous” traits of relatives on the family tree – the point is to isolate the source of sin. One boy is beaten with bibles by his family in an effort to drive out the demons of homosexuality (nope, that’s not a joke). There is also a macho counselor (played by Flea of Red Hot Chili Peppers) who gives inspiring manly talks and teaches how to look, act, and stand like a real man. It’s all so pathetic and tragic. Rather than focus on Jared and the others in the program, much of the time is spent with his parents and why/how they could make the decision to enter him into conversion therapy. Jared’s dad tells him he won’t be loved by God … a message also delivered by Sykes. When Jared’s mom (Kidman) states “our family is so normal”, we aren’t sure whether she believes it, or wishes it so – although she leaves no doubt how she pictures a normal family. Of course, it’s really Jared’s dad (Crowe) who takes the news as a personal affront to his manhood and religious beliefs … beliefs somehow more important than his own son. Support work is provided by Joe Alwyn, Cherry Jones (as a doctor, and the only reasonable adult), Frank Hoyt Taylor, Britton Sear, and Jess LeTourette. Filmmaker Xavier Dolan (MOMMY, 2014) also has a role as Jon, one of those in the program. The music is provided by Danny Bensi and Saunder Jurrianns, and for the most part, director Edgerton stays consistent with his focus on characters – though his frequent use of slo-motion loses impact with each successive use. The film avoids any cheap sentimentality or emotional gut-punches, instead focusing on the daily dealings. Perhaps it’s meant to appeal to parents in this situation – those parents who are confused and misguided. 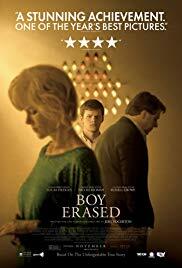 We see this film more than we feel it, although I often found myself looking at these parents and asking, ‘what’s wrong with these people?’ When the film ends by telling us 36 states allow for conversion therapy, we quickly realize Jared’s parents may be more ‘normal’ than we thought (incredible as it seems). Greetings again from the darkness. In 1967 Cat Stevens wrote “The First Cut is the Deepest” and the song has since been recorded by many artists (including Rod Stewart and Sheryl Crowe). The song’s title is also an apt description of director Ritesh Batra’s film version of the popular 2011 novel from Julian Barnes. It’s one man’s look back at the impact of his impulsive actions more than 50 years ago. “When we are young, we want emotions to be like what we read in books”. So says the narrator and lead character Tony Webster (as played by Jim Broadbent). Tony runs a tiny second hand camera store (specializing in Leica models) while leading a mostly benign life – rising daily at 7:00am, coffee with his ex-wife, and periodic errands for his pregnant daughter. One day a certified letter arrives notifying him that he has been named in the Last Will and Testament of the mother of a girl he dated while at University. And so begins the trek back through Tony’s history and memories. Of course, a film version can never quite cut as deeply as a novel, but this preeminent cast works wonders in less than two hours. Curmudgeonly Tony is accessible and somewhat sympathetic thanks to the stellar work of Mr. Broadbent, who always seems to find the real person within his characters. Harriet Walther (“The Crown”) turns in a tremendous performance as Margaret, Tony’s most patient and quite wise ex-wife. Michelle Dockery (“Downton Abbey”) is their pregnant 36 year old daughter Susie, and just these three characters could have provided a most interesting story. The film’s best scenes feature the comfort and familiarity of a once-married couple, as Tony and Harriet talk through previously never mentioned topics. However, there is so much more to explore here as Tony’s thoughts bring the past splashing right smack dab into the present. Billy Howle does a nice job as young Tony, an aspiring poet, who falls hard for the enigmatic Veronica (Freya Mavor). Complications arise when Tony spends a weekend with Veronica at her parents’ estate. It’s here that Emily Mortimer energizes things (and clouds thoughts) with minimal screen time as Veronica’s mother. It’s also around this time where new student Adrian Finn (played by Joe Alwyn of Billy Lynn’s Long Halftime Walk) captures Tony’s imagination and a friendship bond is formed … only to be later shattered in a most painful manner. There is so much going on that director Batra’s (The Lunchbox, 2013) low-key approach is often misleading. Looking back on one’s life can lead to the twisted version that our mind has edited/revised in order to make things seem better or worse – definitely more colorful – than they likely were at the time. Tony’s distorted view of history crumbles when documented proof of his actions is presented at his first face to face meeting with Veronica (the great Charlotte Rampling) in five decades. It’s at this point that regret and guilt rise up, and the only question remaining is whether this elderly man can overcome his repressed emotions and self-centeredness in order to make the best of what time he has left. Each of us has a life journey, and though few of us ever actually tell the story, there are undoubtedly numerous lessons to be had with an honest look back. Greetings again from the darkness. “Thank you for your service.” For those of us who have never served in the military, we say the words because we don’t know how else to show our appreciation. Do the words ring hollow to those in uniform? Maybe. Probably. But how else can we honor these brave souls? What if we have them share a stage with a pop singing group during halftime of a football game? It’s this line between honor and propaganda that takes up much of the new movie from two-time Oscar winning director Ang Lee (Life of Pi, Brokeback Mountain). 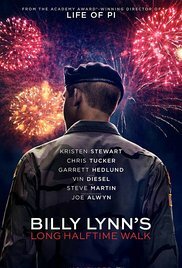 The story is based on Ben Fountain’s 2012 novel, and revolves around soldier Billy Lynn’s and his fellow “Bravo” squad members as they make the rounds back home (in 2004) for publicity after their intense battle sequence is caught on camera. There is much at play here: how the soldiers interact with each other, how they are treated by the general public, how they are used by the team’s owner and the Army for self-serving reasons, and how Billy juggles the stress of war, the spotlight of heroism, and the demands from his family. Director Lee opted to experiment with the ultra-realism of the new 120 frames per second in 4k 3D, rather than the standard 24 fps. Though this may seem like a minor detail that shouldn’t be addressed in a review of the movie, it’s impossible to ignore this impact. 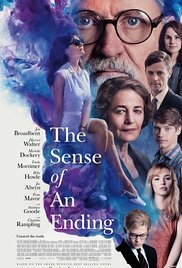 Technical advancements in film and digital have resulted in some exciting new effects for movies, but this high speed approach creates a soap opera look and feel that will likely be disorienting to many viewers. Although the full effect will only be available in New York and Los Angeles (due to shortage of projectors), the clarity on the close-ups is distracting, while leaving the background quite fuzzy and out of focus. Many will find this new look to be “not right” for a movie, and prefer the traditional look. Others may embrace the heightened sense of reality … of being right there with the characters. Of course, this is Ang Lee’s film, so there is no shortage of stunning visuals and expert shots. Beyond the technical aspects, this movie is simply a bit clunky to watch, not very well written (screenplay by Jean-Christophe Castelli), not very well acted, and has an overall awkward and unfinished feel to it. Kristen Stewart plays Billy’s sister, and her limited screen time is the best part of the movie. Newcomer Joe Alwyn makes a decent reluctant (and lucky) hero in playing Billy, but he doesn’t have the chops to overcome the script weakness and the burden of carrying so many scenes. This is especially obvious in his unrealistic bonding scenes with cheerleader Faison (played by Makenzie Leigh). Their scenes together are nearly unwatchable. Supporting work comes from Vin Diesel as Billy’s philosophical officer in recurring flashbacks to the war, Garrett Hedlund as the current squad leader, a miscast Steve Martin as team owner Norm Oglesby (a Jerry Jones type), and Chris Tucker as the incessantly yammering agent/producer trying to put a movie deal together for the soldiers. Other minor contributors include Tim Blake Nelson, Bruce McKinnon (in horrible make-up), Ismael Cruz Cordova, Deidre Lovejoy, and a couple of All-Pro players in Richard Sherman and JJ Watt. Since there are some interesting and important elements to the story, the assumption here is that most effort went towards the experimental technical aspects. More attention to scene detail could have more effectively contrasted the soldier’s take on war versus the never-ending inclination of Americans to turn most anything into more and bigger entertainment … even Destiny’s Child isn’t enough. The questionable filmmaking decisions leave us with the shell of a good story, and too many sappy close-ups of actors emoting directly to the camera lens. The soldier vs hero debate deserves better, and the propaganda aspect deserves a more critical eye.